I am older; not old, just older. When I played with blocks they were made of solid wood. These were essentially the same kinds of blocks that had been around for over a hundred years. Now, I am not talking about the square colored ones that were supposed to teach you letters and numbers; they were pretty useless for building anything. No, I am talking about plain wooden blocks that came in many different shapes and sizes. You could use these to build a city or a fortress, or at least a part of one (I didn't have an extensive block set). These plain blocks were used to try and replicate Karnak and other places I had seen in pictures. My blocks represented the ultimate escape from the doldrums of where I was to where I wanted to be. Yeah I know, I was a strange child. Inevitably I moved on. The blocks were put away much like Puff and his ilk. At the ripe old age of eighteen I began working at a toy store. One of my myriad of jobs was stock clerk. This was a mom and pop toy store. This was before chain stores made their arrival. I was given a carton of new toys to set up on the shelf. I opened the box and was presented with a revelation. It was a ship, and it was built entirely of small click together blocks. As I recall, one part of me was in awe, while the other part was disgusted. How dare they manufacture a new kind of block. The old ones were good enough for me, and all the way back to my grandparents' time. On the other hand, the ship did look awesome. It didn't have guns, and I believe it was a Coast Guard cutter, or something similar. Still, the ship and how it was put together amazed me. I was sorely tempted each pay week to buy it, but never did. My money went to more earthly pleasures. I regret not buying it to this day. I would watch my children, and then grandchildren, play with their little click together blocks. I would see them build pretty much anything under the sun. You would think that I would feel sorry for them, for they had been cheated of flights of fancy. No, that is not it at all. I feel cheated and can only think of what my imagination could have done with these newfangled blocks. Now I am presented with three brand spanking new Cobi kits. 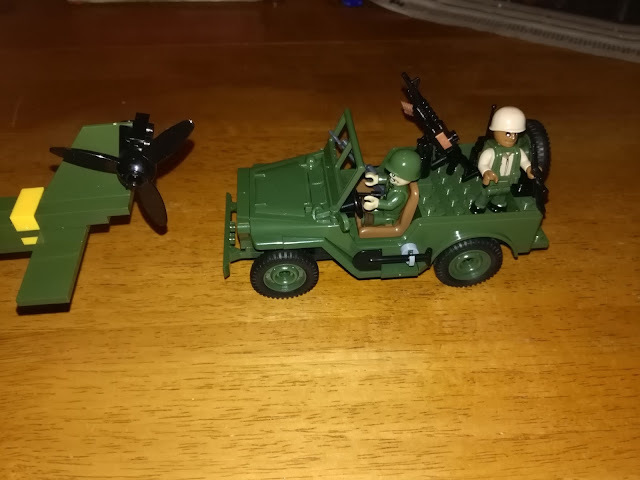 The first is a double set with a helicopter and jeep. The second set is of a P-51 mustang, and the third is of a Sherman tank model M4A1. The first thing that went through my mind was these kids are not touching my Cobi block sets. The little urchins have their own; these are mine. Remember, he who has the most toys before he dies wins. I started with the Jeep and helicopter set. I figured I would work my way through the kits to work on the Sherman last. Jeeps, helicopters, and mustangs are okay, but hey, this is a tank. I tackled the jeep first. 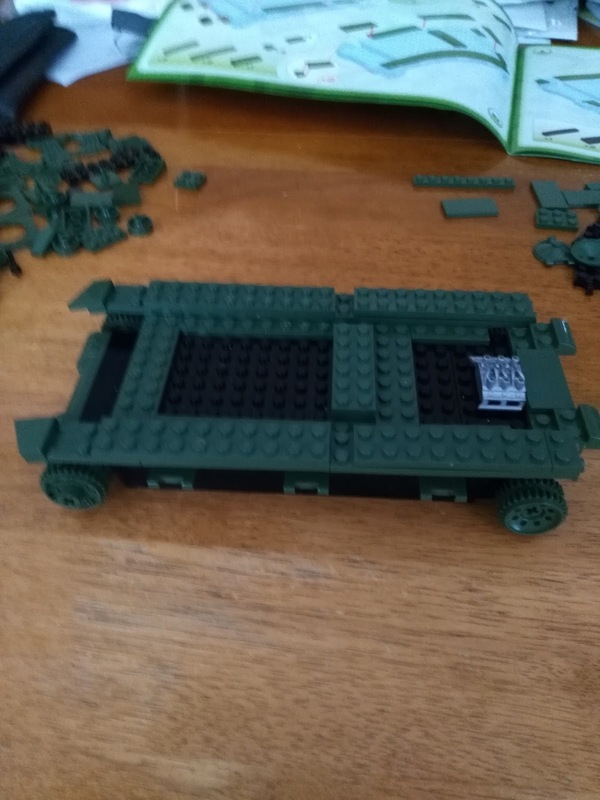 The directions were pretty clear cut, and time seemed to fly by as I assembled it. I am a fairly large man, but I really had no problem fitting the blocks together. The only problem I did have was the blocks fit together like they had been built by Incas. If I made a mistake it was a bit of a bear to get some of the blocks back apart. This is not a knock on the blocks. It only means that your finished work will not fall to pieces on the mantel or shelf. It is also not the block's fault that I failed to follow the directions. A small flat jewelers screwdriver helped me immensely with my foibles. 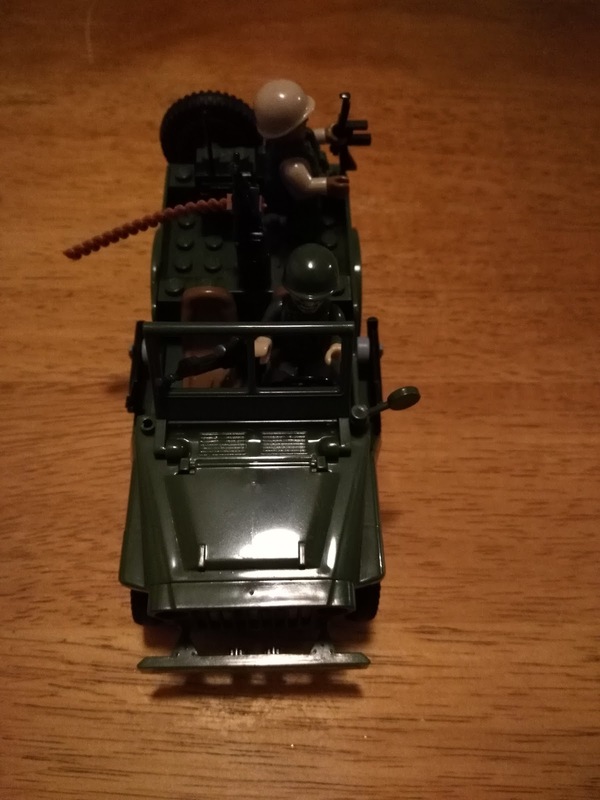 The Jeep was together in no time, and it looks excellent. I was wondering how I would feel while essentially playing with a child's toy. To be honest, the sense of accomplishment was pretty much like what I feel when putting a model together. I will add one caveat: I do not paint my models. I love putting them together, but I cannot paint them to save my life. So essentially this was just like building a model, without the glued together fingers. 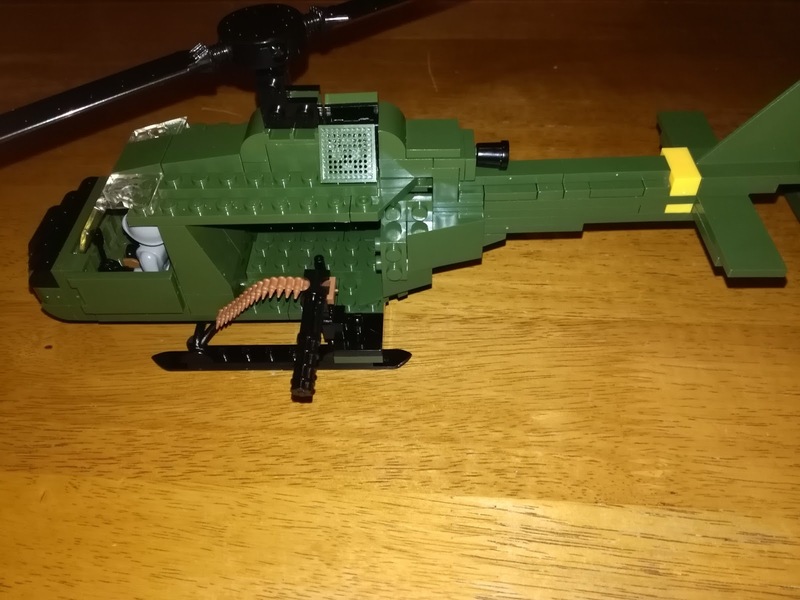 The helicopter was bit more intricate, and if you made a mistake, it was sometimes several pages later that you would realize it. Now that these two are together, I feel more confident of my 'blocking' ability. Next up would be the Mustang. I am a 'Thunderbolt' kind of guy, so the 'Stang' has never really impressed me. 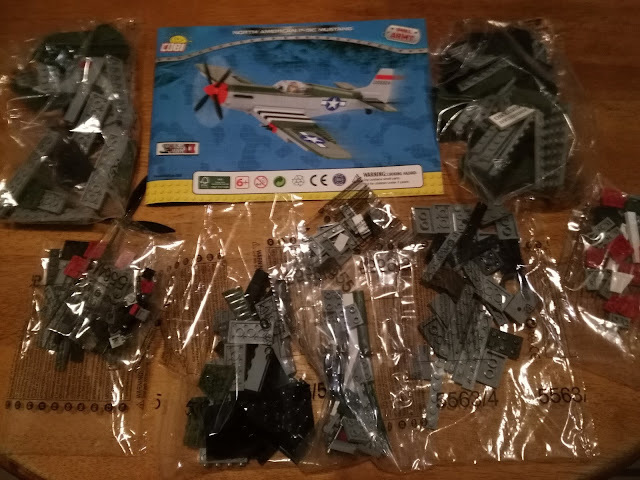 That being said, I do have one model and two diecast of Mustangs in my collection.The P-51 looks from the box to be the most 'toy' looking, and not going to the realistic end of the bar. After putting it together though, I was pleasantly surprised. Once completed it looks very good in the flesh. I thought I was saving the best for last with the Sherman, but I could be wrong. It turns out I was not wrong. 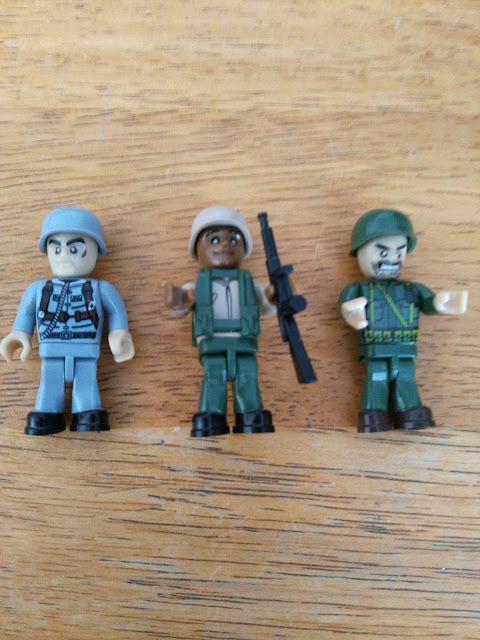 The Sherman is definitely the best of the pieces. There is nothing wrong with the others at all, but the heft and look of the Sherman really impresses. 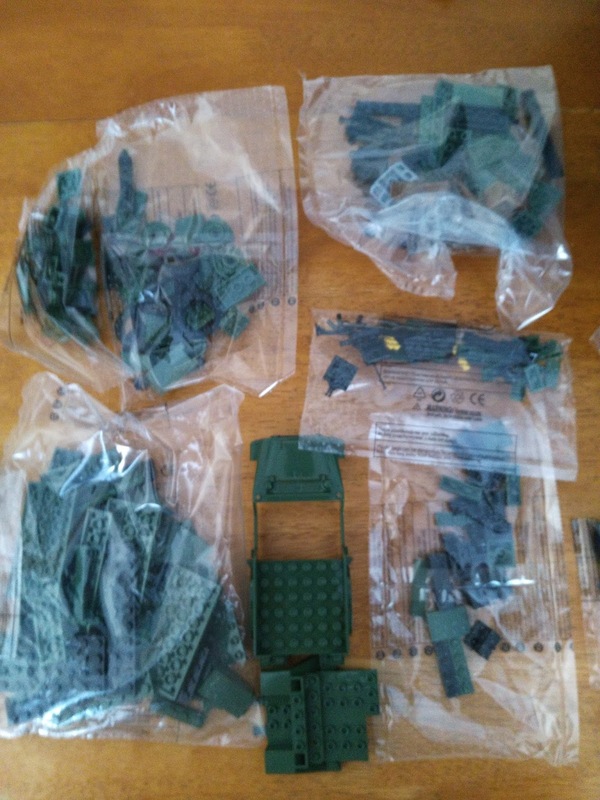 All in all, I am tremendously impressed; not just with the kits themselves, although they are pretty amazing! I am even more impressed by my sense of accomplishment in building them. The kits are really nice, but so is the actual building. One major plus is that if you happen to have urchins around they can also join in the fun. It is not the easiest thing to try and build a model with small hands helping. Been there, done that. The kits have been been given a bad rap at times because they are not sturdy enough for little people to play with. The very nature of any small block building is the same: rough handling will cause the build to start coming undone. It is the nature of the beast. If you are looking for toy tanks and army men to play with outside in the dirt, don't look here. If you are looking for something exciting to build and look at and also to play with more gently inside the house, then these are for you. You can also pass onto your own urchins your love of history and engines of war while you are at it.